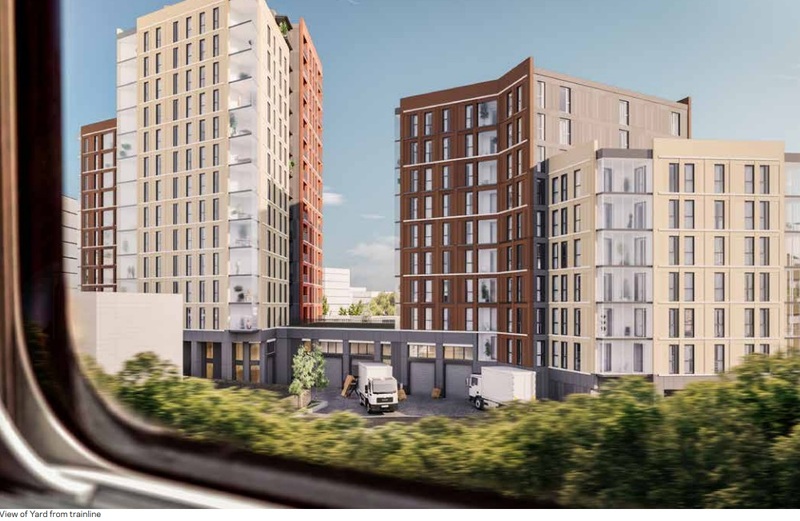 Plans are in for a large development in Deptford at 164-196 Trundleys Road and 1-9 Sanford Street. Formation Architects are behind the design. The site is over the road from Folkestone Gardens between rail tracks on a site not too far from Millwall’s New Den ground. I like the use of warm colours and recessed balconies. The massing looks a big bulky due to a resistance from authorities of allowing a taller, more slender design. On ridiculous thing – which I often notice – is that the base is a dreary grey to reference the “industrial” area. It has a scrapyard next door. Why the hell reference that? It reminds me of the first draft of Abbey Wood’s tower which was the dreariest shade possible because an ugly industrial estate next door was grey. Madness. The development will comprise of two buildings, one part 6 & 9 storeys and the other part 11 to 15 storeys. 189 will be included with 35% “affordable”. The site is not currently that close to any station, with a 15 minute walk to New Cross or New Cross Gate. Public transport accessibility is 2 out of 5. 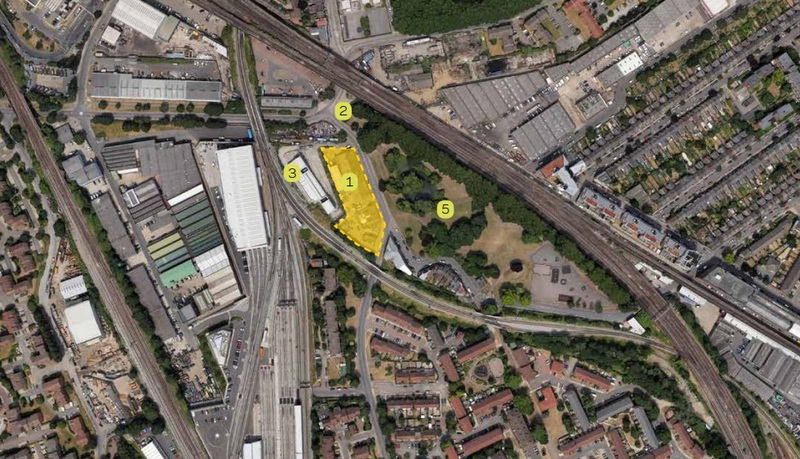 It would be close to the planned New Bermondsey station on London Overground but issues with the Housing Zone around Millwall’s New Den has held that up, possibly for years. It’s built right on the Quietway 1 route cycle route (the very nice part at Folkestone gardens), so it does have that for transport routes. Or at least you could cycle as far as Bermondsey station (5 mins and traffic free). There are few bike racks installed there as part of the Q1 imprevements. I like how the Architects drawing masks the ugly bit with the greenery of the park. The developments around Millwall’s ground were a bit iffy in terms of who was behind it, and links to Lewisham council, but ultimately it was a good scheme. A brand new station and a greatly upgraded South Bermondsey station would have been built. Millwall would have lost a car park but gained a new sport facility. The stadium was untouched. I feel most of their objection is they wanted to do the same thing but retain the profits. Yet they don’t own most of the land. Personally I’d like profits to stay in public from any future scheme not to an off-shore developer, but apart from that its ideal for housing.